A teardown of the Google Glass companion app, MyGlass, revealed a comprehensive Google Games feature list today, including multiplayer services comparable to Xbox Live and Game Center. However, the functionality may have less to do with Google Glass and more to do with the Android platform in general, suggests Android Police. This is because the Google Glass Explorer Edition glasses can't run sophisticated programs beyond apps like the camera, maps, and Google Now right now. 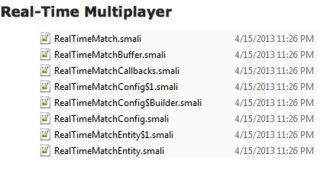 The Android application package file, in contrast, includes both real-time and turn-based multiplayer that would be ideal for first-person shooters, racing games, and fighting games. The Google Games service still gives developers a preview of what the company is working on in the backend and may include in the Android operating system in the future. The files suggest that Google will handle "all that scary net code and matchmaking stuff on their servers," postulates Android Police. "That would be a dream come true for developers." Additionally, the MyGlass companion app code reveals turn-based multiplayer that incorporates notifications service for slow-paced Android games that are played between two or more people back-and-forth. In-game chat files point to sending and receiving voice messages during real-time gameplay, while achievements, leaderboards, invitations and lobbies round out the games app suite. Google IO reveal for Games service? Google Games, which seems like it was an accidental leak through the MyGlass app, certainly exists for some reason, and the Android community may know as soon as next month's Google IO 2013 conference. Glass may be a couple of iterations away from playing games that require such functionality, and the same goes for other files found in MyGlass' backend like wallet, panorama and app search. But Android gamers and developers could certainly make use of a complex games service like Xbox Live or Apple's Game Center to tie everything together.